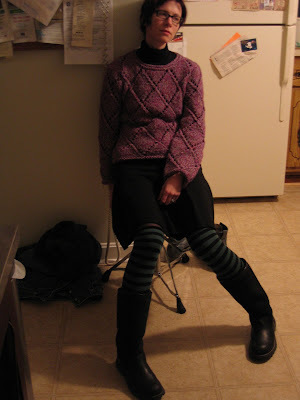 Seeks Sweater in Flattering Hue. It's the Tomten, for a baby shower my Mom will attend in a few weeks. She will be greeted with Western Michigan Dutch Cooking to the Extreme. Stewed fruit compote. Cheesy egg casseroles. Pigs-in-the-blanket. Ultra-sweet cinnamon rolls. Fresh? We don't need fresh! We have lard! Not that I or my family members are health nuts; we all enjoy red meat and wine and beer and chicken with the skin on and butter. But food that is just... shall we say "not good?"... is another matter. First, WHEELS OF FURY!!! It reached my Dad today, so there will be photos to come. My Dad was in a freak motorcycle accident a year and a half ago which severed his spinal cord between C6 and C7 and did all sorts of other damage from which he recovered with the speed and determination of one possessed. Note: when riding a motorcycle, please wear the absolutely best helmet you can purchase. The best helmet is the reason my Dad suffered absolutely no brain damage. Due to Helmet and Weaver stubbornness, he returned to teaching (high school math) part-time about six months after the accident. Six months later he was back to work full time. Oh, and building a frightening upper body in his home gym. And riding one of those hand-pedaled bikes. This hat is my tribute to him. I feel unworthy wearing it, but this will have to do until he sends me a photo of himself. 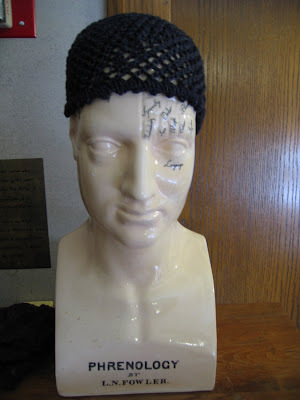 I bring you the yarn for: 300: THE SWEATER. Soon to come: 300: THE SWATCH. The colors and all, well, it was irresistible. Until then, see the movie if you want a stunning work of art that actually reflects much of the Greek conception of self and nation during the period of war with the Persians. Did I note that I was an academic in a previous life? A strange encounter with one of my supervisors last week included a conversation about "Professionalism." A concept with which I have never had a quibble. However, this conversation included many eddying tangents indirectly addressing my appearance. What I gathered, and it was by no means direc tly communicated, is that administrators at this hospital "should be helpful but invisible to patients." In other words, not seen, and heard only in passing and then quickly forgotten. Seeing that this is how I looked during all my job interviews, it seems, in this respect, they've hired the wrong person. Oh, my hair was more of an "eggplant" color during the interviews. 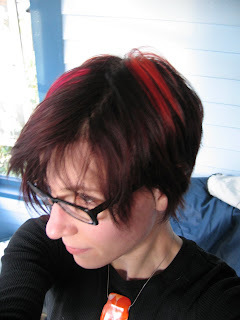 And that hot pink streak, well, it was Safety Orange. Fortunately the surgeons I work for all appreciate my look, which is very professional in all its funkiness. In knitting news: Wolle aus Deutchland ist angekommen! 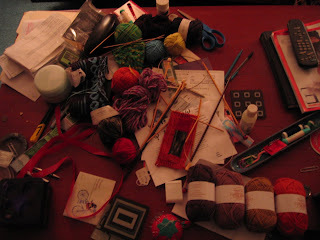 That's Evilla Vorgarn, a skein of 8/2 yarn, and a big hank of Kauni Effektgarn. Chris would not take a picture of me rolling around in it. A new design that I like to call "WHEELS OF FURY." jammies and knitting. While I work on projects I can't show anyone yet, here's the portable knitting I take on my commute. 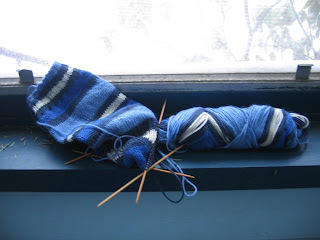 First, a basic top-down sock in something called "Maxi Ringel." I believe this is a discontinued yarn. The fact that I love the way it knits up makes up for the fact that it is splitty and therefore not all that easy to knit. It also has the positive quality of being very, very durable. I made Chris a pair of Maxi Ringel socks two years ago, have been washing them in the delicate cycle of the machine about every 2 weeks, and they still look great. 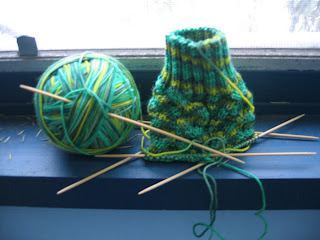 The green one is a Yukon Leaves sock (I printed this pattern out years ago, and am not sure if that link will work...), knit in Socks that Rock lightweight, color: Emerald Isle. 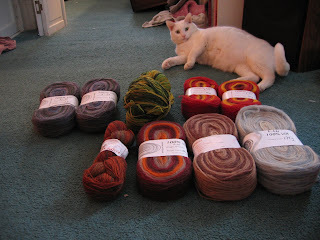 No complaints about the quality of this yarn. While staging these photos on the porch, I locked myself out of the house... choices were to wait until Chris got out of the shower and could hear my yelling and door-pounding or to run through the quickly-accumulating snow drifts around our apartment building to our back door. Chris was taking his time, so I did the latter. That was enough "outside" for a while. 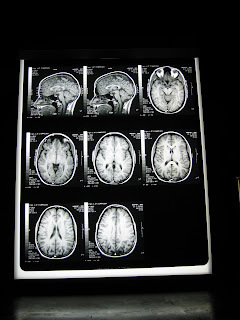 That's an MRI of my head. Just sayin'. Chris got me the viewer for Christmas from some crazy surplus place on ebay. And a glimpse into the work process here. This is what's in the works right now. Bins and shelves of other things reside in every other room of the house. The four colors on the bottom right are going to be a R ed Light Special hat very soon. As soon as Chris saw the gallery that Brooklyn Tweed set up, he declared that he needed one. Time to get to work. The weekend was focused on hats. I finished two, both from fantastic patterns. The one on the right is the Snood from Domiknitrix, made from a little over one skein of Crystal Palace Shimmer in black. I haven't b een able to find Shimmer at any local yarn stores, but ordered this from Royal Yarns, which got it to me really quickly, considering that the color was backordered! I followed the pattern exactly, and what a well-written pattern it is. I'm looking forward to making several projects from this book. First? The Slink, also made of Shimmer, which I've decided I like a lot. Stretchy! Soft! Shiny without being gaudy! Below are both new hats in the sun on my Real Wood Desk. 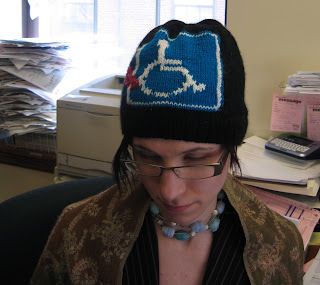 On the left is a hat from Knitting Nature... I believe it's called the "droplet hat." 1.5 skeins of Noro Cash Iroha in color 94. Worn all day Saturday in soft comfort with no itch. 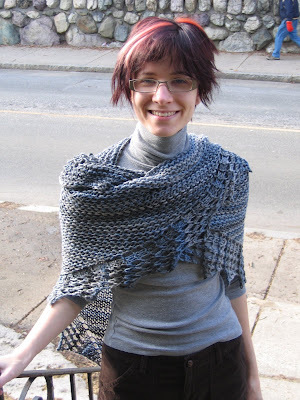 Also a fun pattern to knit, creating the kind of sculptural, worked fabric that I enjoy in small quantities (why all the bobbles on sweaters lately? I know I'm not the only one wondering about this). In progress now: several designs. for my parents arrived at their house yesterday, so I can post the photos here! On the left, a shawl of my own design for my mom, requested to match one of her favorite skirts. I'll call it the "Picot-Point Shawl," since it's just your basic garter-stitch shawl with a not-too-dainty picot lace edging. 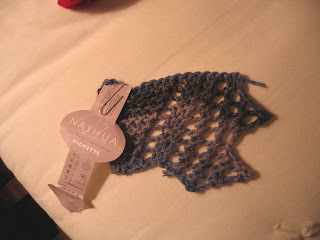 I used 4 balls of Nashua "Vignette," which is a 100 % wool yarn that's actually a sort of knitted tube. This makes it light, warm, and makes a really interesting surface with minimum work. I can't find it online, but I got mine at Windsor Button here in Boston. 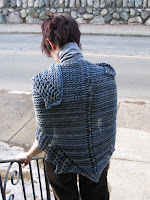 I'll give a view from the back as well (knitters, you may see the flaw that led Chris to dub this the "scoliosis shawl." Okay, so I finished it up really la te one night and I may have had a few beers. Okay!). Also included in the box was a pirate hat for my dad, requested after he saw the photo of Leah in hers (see sidebar). And some secret things that my mom is going to model for a future pattern publication. She's lovely, and I like the idea of someone other than my nearly-thirty IRS self (Indie Rock Secretary... not my idea! A waiter once told me that was my look, and, well, it fits) modeling cool knitwear. 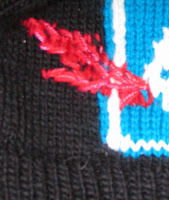 Here's the hat. 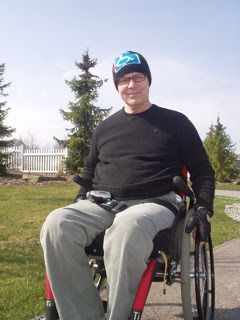 It matches his wheelchair and hand-pedaled bike perfectly. He used to have a motorcycle and all the accompanying gear in red and black as well. I'll wrangle a photo of him wearing it to post here. I have some good-looking parents and I want to show them off. 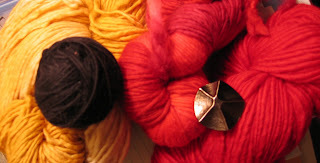 This morning was spent at Windsor Button buying yarn for some upcoming designs. Coming up Monday: Parade of Hats. I found a very special place to photograph them at my New Job. just in time for the "Alberta Clipper" whipping through the area. Some weather slang (I know you love the BIG WEATHER content, Mom) for very cold winds. I decided not to do the big turtleneck thing the design calls for and just purl 1 row, knit one row, and bind off in purl. Easy. The sewing up and finishing was difficult, however; I think anything bulky needs extra care in the finishing department to keep it looking professional. I was rewarded for my extra effort every time I looked at the sleeves and could not tell where the seam was. Hooray! 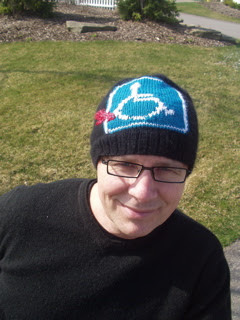 And there is a matching hat. Action shots of that when it gets warm enough to leave the big Russian fur hat at home. 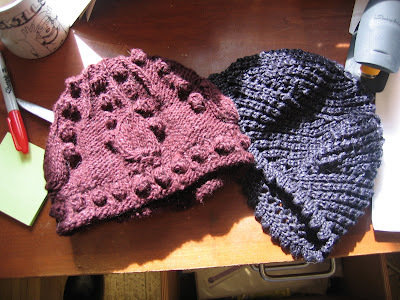 Next up: two hats from patterns and one very special one of my own. So when one works for a temp agency, one sacrifices some of one's pay to said agency for the privilege of getting placed into positions that, in my case, my resume would never get me. Another secret is that, even when one gets a "temp-to-permanent" position, one is under contract with said temp agency, making severely reduced wages, for SIX WEEKS. That's four weeks, four days more for me. At least I don't have to wonder when those above me will decide to transition me into the actual job position with benefits and all... that would be four weeks and four days from now. To the right is a portrait of our two boys, Max and Henry Chinasky. 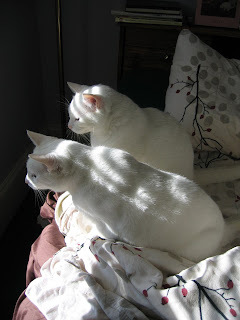 This is where they spend their days when I remember to open the curtain for them. This is where I spent my days with them before Debt Servitude kicked in. The countdown begins. No knitting to show, since it's all secrets, secrets. 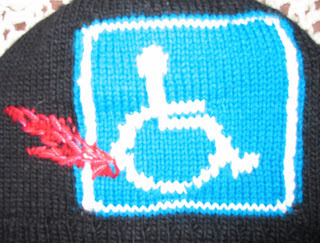 pay our COBRA health insurance bills are never forgotten when it comes to knitted goods. If anyone does not know what COBRA is, lucky you. You are either exceptionally young, healthy, prescription-free and reckless, or you have never quit a job at which you had health insurance. 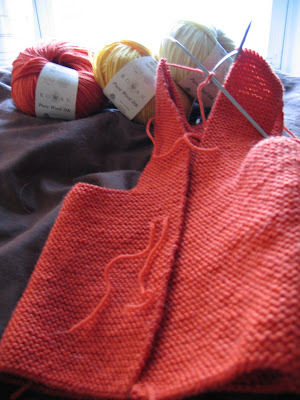 In any case, this is a sneak peak of the shawl for my mom that is currently blocking on the floor. My own simple design; photos and details upon its arrival. I know you're looking, mom and Dr. Wheels. In other news, my new job includes a real wood floor in my tiny office, as well as a built-in real wood desk, small, yes, but wood. So warm and rustic that I got a splinter in my foot Monday when changing from my winter boots into my work shoes. The Faux-Oak name plate I got when I was a state bureaucrat has nothing on this.